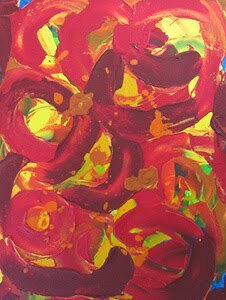 I hang original abstract paintings in every room to create an art gallery at home. Having bold modern art on display in my home is for everyone to enjoy. My living space shows my love of color, shape and texture with all the bold colorful canvases I have. 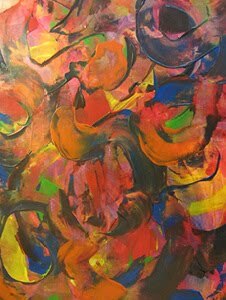 I love to pair colorful abstract art in my home with eclectic furniture pieces, comfy pillows and great lighting to show off the wonderful decor items I’ve collected over the years like pretty vases, pottery and glass. Of course it’s the beautiful modern abstract paintings I hang that bring everything in a room together. The colors and textures in the abstract art pick up all the colors of the surrounding art and decor, creating a dynamic multi-layered space. If you’re starting a home decorating makeover and want your own art gallery, begin with the room you’re in the most then pick your colorful paintings first. You can update any space by using a bold contemporary painting, because abstract art creates a great focal point and brings all the other design elements in a room together. View your space with an abstract painting and then without and you’ll see the difference immediately. 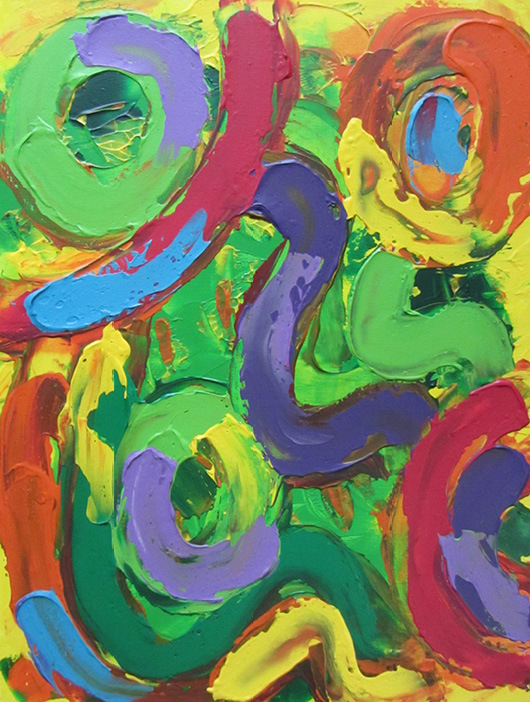 The abstract painting Mother and Child shown above is a textured acrylic in green, purple, blue, red, yellow and orange. In this modern abstract painting a mother travels with her young child on the bus. While most of us are rushing off to work, she is raising the next generation. This original wall hanging measures 18" x 24". I like combining furniture and decor items that don’t match, it creates tension and interest and makes a room look bigger. Then if the contemporary abstract art I hang has the right mix of colors to go with each piece of furniture it brings the whole space together. Too many people decorating with bland neutrals, so have fun with your home decorating. This is how it works! Do you have furniture and home decor items that you want to place together, but the problem is that no matter what you do the end result just doesn’t work? For instance you want to place a striped armchair together with a floral footstool. Then try this. Hang a bold abstract on your walls with colors that compliment both pieces of furniture. Watch the space be transformed into a cozy corner by using your colorful abstract canvas as the bridge to connect the mosaic of beautiful tones and textures in your furniture. The clashing fabrics now seem like they were meant to be together. Once you try this decorating with abstracts technique you’ll want to use it everywhere. 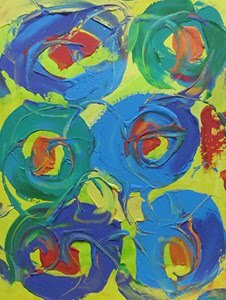 The abstract painting Backyard Lanterns shown above is a textured acrylic in green, blue, purple, red, yellow and orange. In this modern abstract painting strings of colorful paper lanterns are hung in the backyard as the sun goes down and gives ambience to an evening under the stars. Night is my favorite time of day. This original wall hanging measures 18" x 24". Hanging abstract paintings is an easy way to redecorate. It takes minutes instead of hours. So don’t bother painting your walls another dull neutral color. The walls may look fresh for a few days, but soon they’ll just feel drab and you’ll be tired of your living space yet again. A boldly painted abstract canvas will do a better job. Wallpaper is another option, but it’s a big undertaking. A beautiful abstract wall hanging may be better suited to the space you’re decorating. 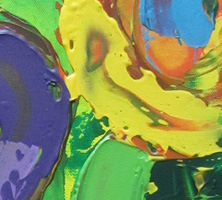 A colorful contemporary painting will evoke that bright welcoming atmosphere you want for connecting with family and friends without the hassle. Also if you want to declutter your living area and create better flow, rather than buying more furniture to put things in, let go of things you don’t need. If the room seems sparsely decorated after decluttering then hang abstract art on the walls to give the room that warm inviting lived-in feeling, because while sparse living spaces are trendy, they can feel cold when devoid of color. So fill up your walls with beautiful bold abstract paintings and live it up with the extra moving around space. 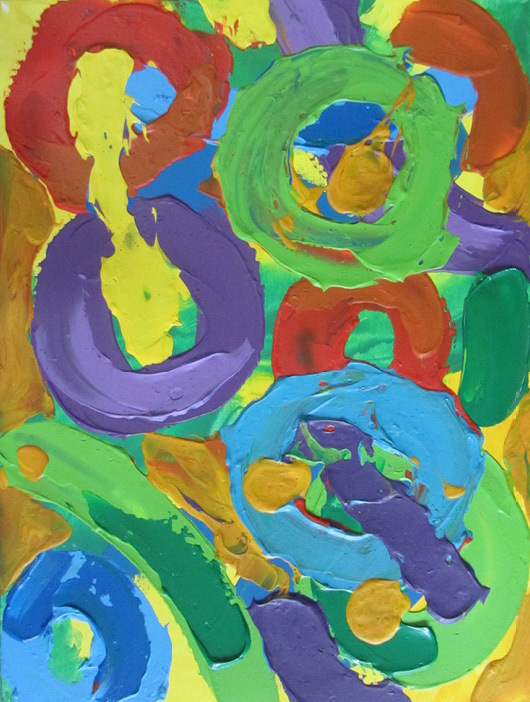 The abstract painting Bumpy Bus Ride is a textured acrylic in green, blue, purple, red and yellow. In this modern abstract painting the transit bus hits the brakes causing you to fall over the guy next to you and spill hot coffee on him. You start to apologize, but then you remember he was so rude to you the day before. This original wall hanging measures 18” x 24”. 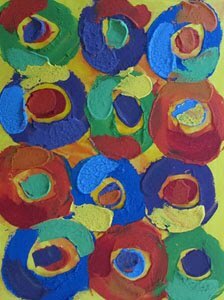 For bold textured abstract paintings I use a high gloss varnish. 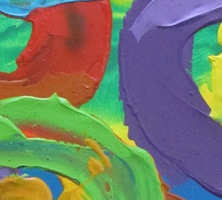 Colors and textures pop with glossy finishes, so the more shine the better for colorful abstract art. 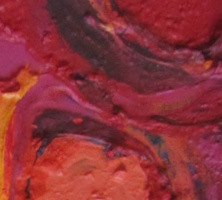 Varnish applied to bold textured abstracts highlight colors and contours to make an original painting a bold work of art. It’s also good to varnish contemporary canvases for added protection. 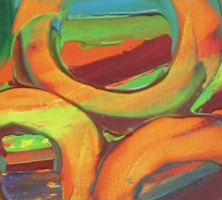 Experiment with a gloss or mat varnish on abstract paintings and decide what works for you. You might like both paint finishes for different reasons. I prefer a triple thick clear glaze spray varnish. The thicker varnish creates an abstract wall hanging that has more brilliance, depth and visual weight so my modern abstracts are like an added piece of furniture in a room. This helps create balance where needed in a space. Gels mediums used to thicken paint during the painting process is another technique to try. Gels can add texture, slow paint drying times, add shine and translucence. 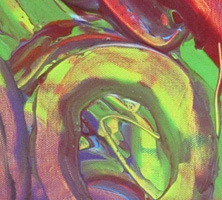 Learn to use these different gel mediums to create effects that suit your constantly developing modern abstract painting style. 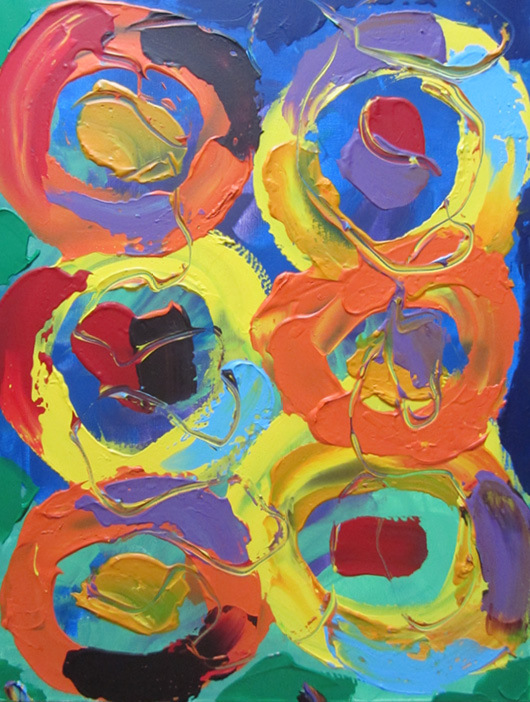 The abstract painting Lemons and Peaches shown above is a textured acrylic in red, yellow, orange, purple and blue. 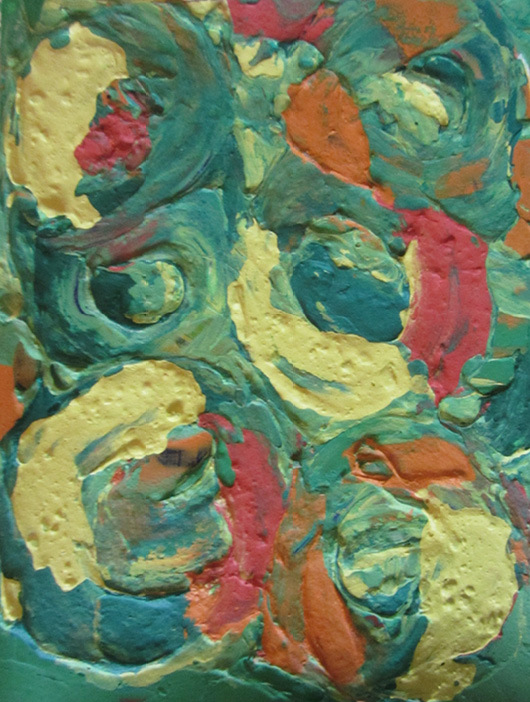 In this modern abstract paint was applied in bold swirls. An enticing fresh fruit market with rows of colorful sweet and tart fruit invites you to dream up a refreshing picnic dessert. This original wall hanging measures 18" x 24". 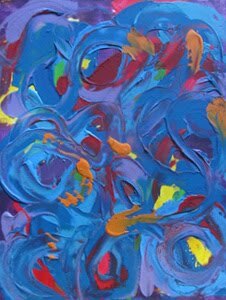 While abstract painting I like to have many original works of art on the go. I rotate what I paint, so when I get back to a big modern wall hanging or small canvas painting it seems like new to me and I know the next step to take in the creative process. In the interim I look at other artists’ painting techniques for research and inspiration, I also buy supplies for painting. 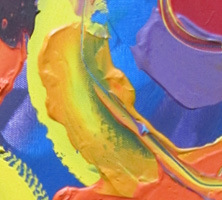 When buying paint supplies I try new things, for instance I found a triple thick glossy varnish I like and a paint thickener that adds texture and extra body to my colorful abstract paintings. I’m also learning that being an abstract artist isn’t just about painting. 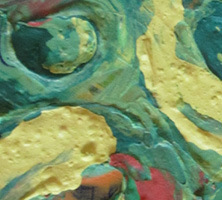 I’m taking pictures of my paintings for my new upcoming website and for my abstract art portfolio. Finally a project I’m most excited about is a book I’m writing about how to use colorful abstract paintings as a focal point in home decor and as a starting point for a design makeover in any room. 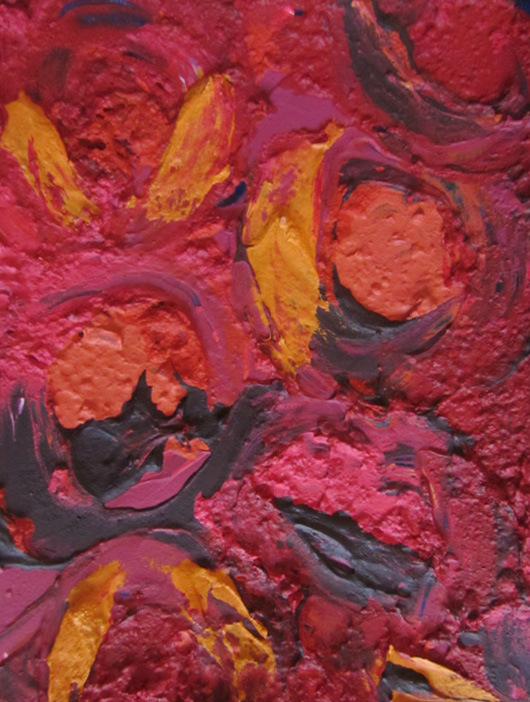 The abstract painting Fire Walk shown above is a textured acrylic in red, purple and orange. 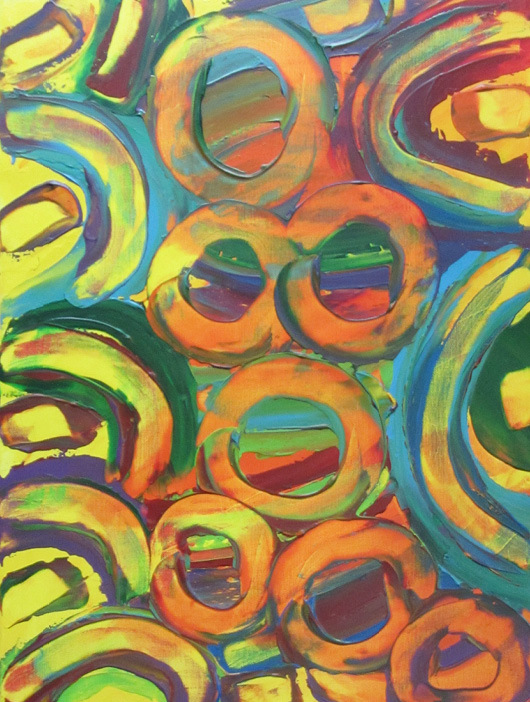 Paint was applied thickly in bold swirls in this modern abstract. A walk across hot coals seems impossible, but when approached with confidence you can make it to the other side. This original wall hanging measures 18" x 24". Abstract art makes a powerful statement and focal point, creating an inviting space in your home. 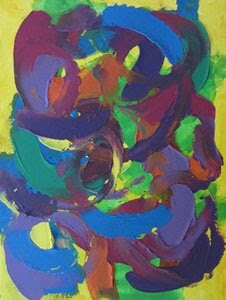 Be brave with your choice of art and design, brighten your house with colorful contemporary abstracts. Many people don’t feel happy in their living space with bare walls staring back at them, but don’t know what to do about it. If that’s you, be captured by bright colors, bold brush strokes and thick textures found in many abstract works of art today. 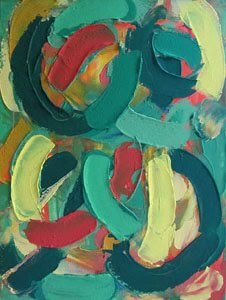 The best original abstract canvas for you will have that undeniable feeling of bringing everything together and your eyes will always gravitate towards it. Continue to add original abstract art to your home’s decor and each room of your house will feel like a comfortable and welcoming space. 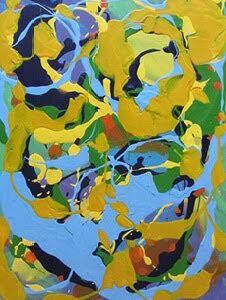 You’ll discover that you not only have an appreciation, but also a feeling of rejuvenation and contentment when viewing your bold and bright abstract paintings, and so will the rest of your family. 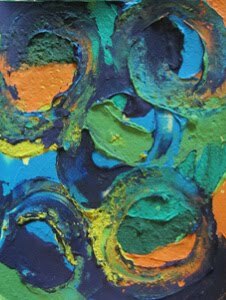 The abstract painting To the Moon and Back shown above is a textured acrylic in green, yellow, red and orange. 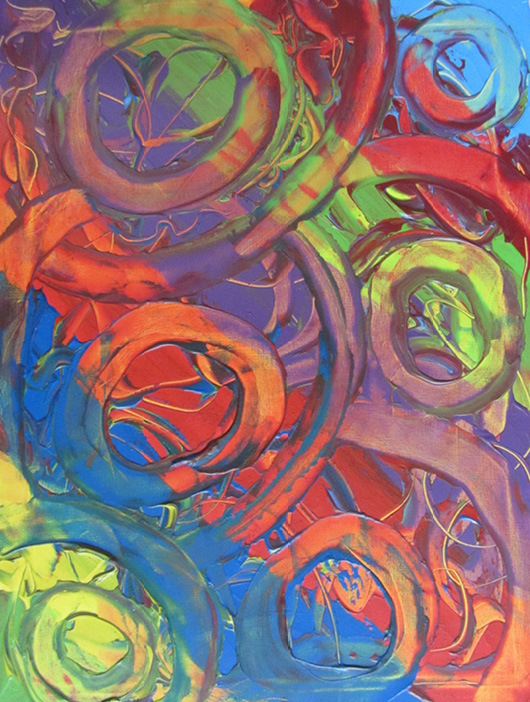 Paint was applied thickly in dramatic swirls in this modern abstract. It’s just one of those days where anything is possible, like you walking on to a spaceship for a short journey around the galaxy. This original wall hanging measures 18" x 24".